Philip Kennicott's article on the Ring in the current issue of Opera News makes some claims which are considerably more tendentious than the tone of the article grants. For instance, Kennicott seems to imply that the ideological viability of the Ring stands or falls by the person of Siegfried. Surely Siegfried can hardly be less than problematic, but a number of interesting stagings have rendered him less central than Kennicott claims he must be. Take Brünnhilde, for instance: Definitely the Opera has a recent post about the significance of her arc in the narrative and how different directors have treated it, especially from feminist perspectives. And come to that, is the Ring's status as an opera (or four) of ideas really that exceptional? I might argue that the Ring differs from other philosophical reflections in operatic form in degree, not in kind. (If I argued this, of course, I would not be able to cite sources other than the operas themselves and I could never maintain a debate. I need to read some books about Wagner. My father suggests that I should "just add another degree on the side." I disagree. But I do want to read some more books.) At any rate, I enjoyed reading and rereading the article, sometimes wondering how I would formulate a polite and intellectually respectable disagreement with Mr. Kennicott over coffee, and sometimes just savoring things like a description of Ring-lovers as "itinerant crowds of slightly deranged pilgrims who will hop continents to see it." Can I add "become slightly deranged Ring-pilgrim" to my lifetime to-do list? William Berger, in his entertaining Puccini Without Excuses , quipped that "there seem to be more exclamation points in the libretto of La Gioconda than in all other libretti combined." Hyperbole, but he has a point: many of the exchanges in this fraught drama appear to consist almost entirely of impassioned outbursts. (Exclamation-ridden libretto (by Arrigo Boito, no less!) here, Wikipedia synopsis of the wild plot here.) The friend whom I met in the Rush Tickets line is currently singing Enzo, so with his inspiration and with his help finding recordings and a full score, I've spent some time working on connecting with and appreciating this work. And as a reward, I got to hear performances with the New York Opera Forum. (There is a lot of opera lurking around this city! That may become the topic of a post at some point.) Not insignificantly, I think, the liner notes for the remastered first full recording lament that "it is easy, though mistaken, to regard it as a less than excellent opera." Based on my own experience, I would say that it can be easy, and may well be mistaken. But it has certainly moved me to think about what I expect of opera conventions, and what the merits of lavishing loving investigation on not-quite-masterpieces may be. Let joy be un-confined! Let there be dancing in the streets, drinking in the saloons, and necking in the parlor! I decided it was high time I saw the Marx Brothers' "A Night at the Opera." I have to say I prefer Chaplin's comedy to that of the famous trio, but I tried to give it an open-minded go. 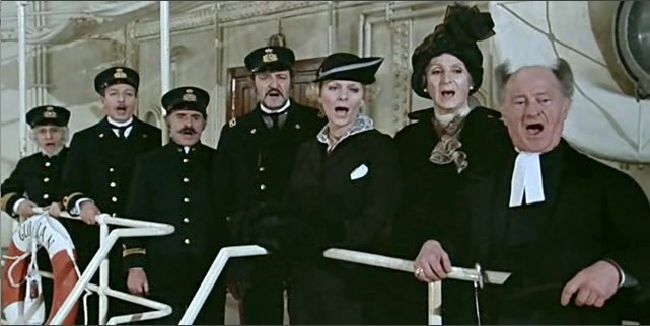 There is of course the famous stateroom scene, but more interesting is to me is this one, where impossible capers of all kinds are introduced into a performance of "Trovatore," unsettling the well-heeled audience and the musicians alike. I must confess, though, that I never really settled into enjoying this example of the genre of slapstick comedy/MGM musical. Probably this says more about me than the film; I was unable to switch off whatever trained listening had me reacting to the introduction of operatic fragments as though they were supposed to illustrate the plot. No: a fragment of "Vesti la giubba" is sung in high spirits (!) and the "Miserere" from Trovatore, after apparently concluding the opera (!) was encored as a triumphant love duet at the end. That was painful. Also, important and persistent questions--the nature of 'high' and 'low' culture/art, the relation of profit to the creation of opera, reputation to talent in the forging of careers--kept being introduced into the plot and then just left there to be dealt with by means of, well, slapstick comedy. The second installment in my exploration of "opera in film" was much more successful: Fellini's "E la nave va. " Now, this, I loved! Not only does it include musical extracts in an illustrative way, it sometimes gives them alternate texts (unfortunately for my inadequate Italian, they weren't subtitled, but I still found it fascinating.) The "normal" proceedings of the film often erupt into choruses at significant moments. And not only opera, but dreamy piano pieces, lively folk music, and even complex water-glass playing (!) contribute to the aural landscape of the film. Extravagant and enigmatic characters inhabit the artificial, luxurious, threatened environment of a cruise ship, bound in 1914 to scatter the ashes of a diva off a Greek island. Moral and immoral decisions are made. Love blossoms and love is betrayed. And it's all gorgeous, and a great deal of fun, as well as poignant. Admittedly, I often hum it in German, thanks to Fritz Wunderlich. But in either language, I find this irresistibly beautiful: the strings not only like wind and stream beside the little cottage, but like Des Grieux holding his beloved Manon in his arms. Sigh.